The deluge of rosé in your Instagram feed probably isn't going to subside as the weather warms. You are going to have a tough time hiding from the "Yes Way Rosé" and "Rosé All Day" posts that are going to start gaining momentum this month. 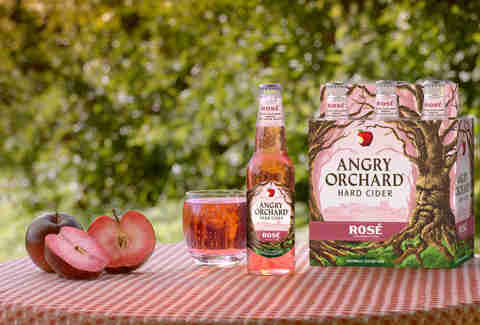 The first proof that rosé won't go away may be Angry Orchard's announcement of Rosé, its newest year-round cider. It might just be enough to get beer-lovers on the rosé wagon (or is it a pool swan?). The cider is inspired the light, fruit-forward flavors of rosé wines. Oh, and the pink color, which makes it social media-primed. Angry Orchard's hard cider is made using rare red flesh apples, which it has sourced from France. There's also hibiscus and a total of six apple varieties in the bottle, giving the whole thing a floral aroma and light tannins. 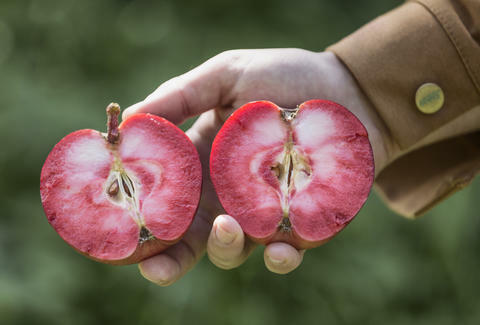 The pink hue of the cider come directly from the red flesh apples. A spokesperson tells Thrillist Angry Orchard has been experimenting with the recipe for three years, working to get this right. "The cider-making team has traveled around the world to find high-quality apple varieties to use in their ciders," the spokesperson said. "When looking to create Rosé, they knew they wanted to continue driving apple-forward flavor and looked to find the perfect apple to do so." The team ultimately landed on Amour Rouge apples from Brittany, France. Cider sales exploded over a five-year period from 2011 to 2016, but have since stagnated. It's not surprising that cider-makers are trying something different, like jumping on wine's biggest trend. Rosé only accounts for 1.5% of sales in the table wine category, according to Nielson. Yet, it's growing rapidly. Over a 12-month period ending December 2, rosé sales rose almost 40%. Angry Orchard isn't the only major cider producer giving this a go. Crispin, owned by MillerCoors, is producing one as well. You can also track down varieties on the theme from Virtue (Cider Rosé), Strongbow (Rosé Apple), Citizen Cider (bRosé), Wölffer (No. 139 Dry Rosé Cider), Cidergeist (Bubbles), and Original Sin (Dry Rosé Cider), among others. Even vodka producers are jumping on the rosé bandwagon. So, if you're looking for shelter from the rosé storm, you may just have to delete your Instagram account.